Life just got a little easier for animals at the Humane Society of Silicon Valley, thanks to the efforts of the lower school’s grade 1 community service project. The students showed their love for the shelter’s displaced rabbits, dogs and cats by collecting monetary donations, buying needed supplies and making toys for distribution to the shelter. “We raised about $900 (a new record) and collected more than 80 bags of toys, supplies and food for the animals,” reported the students’ homeroom teacher, Cindy Proctor, who oversaw the project. 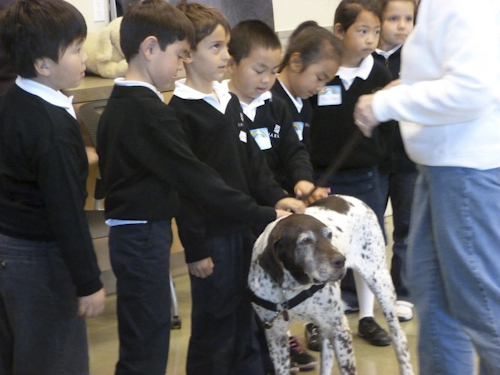 Before beginning their donation drive on behalf of the Humane Society of Silicon Valley, the children visited the 80-year-old independent, nonprofit animal shelter. They toured the facility and learned what the organization does as well as how best to care for their own pets. In computer class, the youngsters made posters about the project, and in other classes, they made pet blankets and toys for donation. Parents also got involved in the drive, as students were encouraged to earn money for the humane society at home by doing small jobs. In addition to monetary donations of any amount, items for collection included animal treats, collars, litter, toys, clean blankets, sheets, towels and comforters. “We would like to express our thanks for the tremendous support and generosity of our Harker families for participating in this project. The donations continue to come in and we are extremely grateful,” said Proctor.